March 21, 2014, As expected, the Singer Ana Karylle Padilla Tatlonghari is now Ana Karyle Tatlonghari-Yuzon. They announced last January 2014 that they were officially engaged and revealed that they will get married by March 2014. 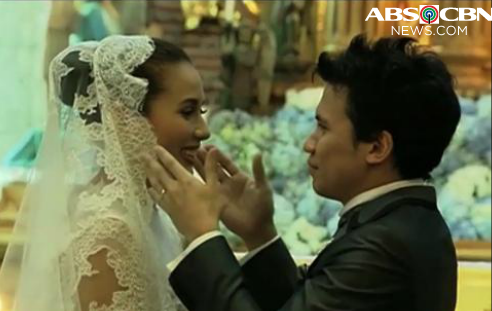 Yael Yuzon -the Spongecola vocalist- is now the official husband of Karylle. According to ABS-CBN news, Singers Karylle and Yael Yuzon, shared their first memorable kiss as a married couple on their wedding ceremony. They were been together for more than 3 years and finally bowed to each other at the wedding that takes place at San Antonio de Padua Church in Silang, Cavite. It says on the news that Kris Aquino and Anne Curtis where present on the wedding and said that they cheered when the couple kissed before hugging each other. Netizen are waiting for this moment to see Karyl and Yael as an official married couple. In behalf of this blog, we congratulates the newly wed couple and we hope that they will live happy and contented to each other.